NYC, 05/22/2019, 2:00PM. 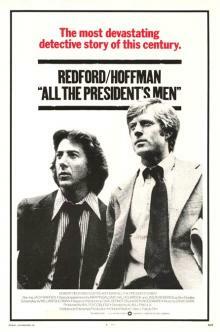 All The President's Men (1976): Four Time Oscar Winning Drama Starring Dustin Hoffman And Robert Redford. The Washington Post reporters Bob Woodward and Carl Bernstein uncover the details of the Watergate scandal that leads to President Richard Nixon's resignation. 138 min. Director: Alan J. Pakula. Starring Dustin Hoffman, Robert Redford and Jack Warden. In 2007, the movie was added to the AFI's 100 Years... 100 Movies (10th Anniversary Edition) list at No. 77. AFI also named it No. 34 on its America's Most Inspiring Movies list and No. 57 on the Top 100 Thrilling Movies. The characters of Bob Woodward and Carl Bernstein shared the rank of No. 27 (Heroes) on AFI's 100 Years... 100 Heroes and Villains list. In 2010, All The President's Men was selected for preservation in the United States National Film Registry by the Library of Congress as being "culturally, historically, or aesthetically significant".